Thad Lacinak, who helped train Dawn Brancheau, said she was very good but made a mistake by lying down on a watery shelf next to the 12,000-pound animal and letting her long hair get in front of the 22-foot orca named Tilikum - the largest killer whale in captivity. "She was an excellent trainer, one of the best I've seen in my life ... But allowing her ponytail to drift into the water like that in front of the animal turned out to be a fatal mistake," Lacinak, who left SeaWorld in 2008 after a long career to start a consultancy, told The Associated Press. Lacinak said he'd been told how the attack happened by other trainers who were at the scene Wednesday, when Tilikum dragged Brancheau into the water as she gave him pats and other rewards after a midday show. Based on their description, he said the rules for handling the giant orca that were in place during his tenure had either been broken or changed. There were special protocols for handling Tilikum because of the animal's size and involvement in two earlier deaths. Tilikum was one of three orcas blamed for killing a trainer in 1991 at a theme park near Victoria, British Columbia. In 1999, the body of a naked man was found draped over Tilikum at SeaWorld. Officials said the man had stayed in the park after closing, apparently fell into the whale tank and died of hypothermia, but was also bitten by Tilikum. 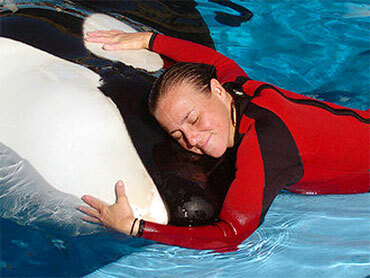 Lacinak said the protocols he knew would have prohibited a trainer from lying down that close to this specific orca. "She laid completely down, which is a very vulnerable position to be in with an animal like Tilikum. And apparently her ponytail drifted into the water, he just opened his mouth, sucked it in and pulled her in the water." It was playful curiosity, Lacinak said, and not a bloodthirsty attack. Brancheau's ponytail was merely a "novelty item" to the whale, who was not trained to be in the water with people. Lacinak said the whale likely first grabbed the ponytail as a toy, then dragged the trainer into the water in more of a playful, investigative manner. Once the whale had her in the water, it likely became a game. "It was more novelty, he's like, 'Hey look, you're in the water, I'm going to play with you,"' Lacinak said. However, he added, once other trainers dropped nets in the water, trying to separate the whale from the woman, it may have become more aggressive trying to "keep his toy." The killer whale shows have been suspended at SeaWorld's three parks in Orlando, San Antonio and San Diego. Chuck Tompkins, chief of animal training at SeaWorld parks, said Thursday that the shows won't resume until trainers understand what happened to Brancheau. He also said trainers will review safety procedures and change them as needed. The park says Tilikum will not be destroyed, transferred or released and that he is an important member of the eight-whale pod. Brancheau was killed in front of about 20 visitors who had stuck around after the noontime show. They watched in horror as Tilikum charged through the pool with her in his jaws. Authorities said that trainers trying to help her could not get into the water because Tilikum was so aggressive. They had to coax him into a smaller pool and raise him out of the water on a platform before they could free her. She likely died from multiple traumatic injuries and drowning, the Orange County medical examiner's office said Thursday.